NOTE: These Blu-ray captures were taken directly from the Blu-raydisc. The 1080P transfers are all “Director-approved HD” with max’ed out bitrates for No Telling and Habit and strong renderings for Wendigo and The Last Winter. They looks great – heavy grain on the 1.33:1 The Habit and 1.78:1Wendigo – both shot on 16 mm (Eastman EXR 500T 7298.) Colors are bright and rich – there is tightness with the 2006 The Last Winter (2.35:1) looking the best and No Telling (1.78:1) also looking very strong. Contrast is layered and adeptly exported by the HD. I was impressed with all of them and they seem deserved of the director -approved moniker. I have no complaints, whatsoever. Ditto for the audio – every feature has the option of a DTS-HD Master 5.1 surround (bumps) at a high kbps or a similar encode 2.0 channel – both in 24-bit. Scores are by the likes of Jeff Grace, David Van Tieghem, Tom Laverack, Michelle DiBucci and Geoffrey Kidde and seem very accurately reproduced via the lossless options sounding appropriately strong or modest in accordance with the original productions. There are optional English subtitles for each feature (see samples below.) The Blu-ray discs are region ‘A’-locked. Supplements are endless and I have not got through all of them yet – we get audio commentaries by writer/director/executive producer Larry Fessenden for each feature and an additional one for Wendigo with actors Patricia Clarkson, Jake Weber, and John Speredakos. 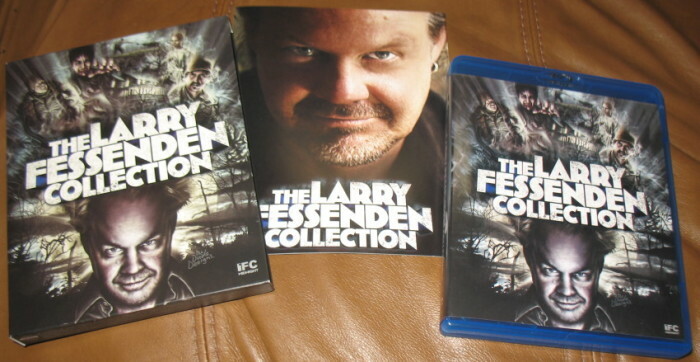 Fessenden also does introduction for most of the other extras on the discs which include extensive making of’s, archival footage, at least 7 short films (I watched “Santa Claws” and loved it), interviews, music video, trailers and, the production company’s Glass Eye Pix Sizzle Reels and the package has a 24-page booklet with liner notes by Fangoria’s Michael Gingold, featuring never-before-seen photos, storyboards, and sketches.